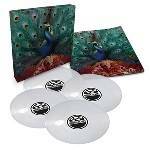 Limited edition 4 x 10” clear vinyl box set of Opeth's 12th album plus live tracks! More information: For 12th album ‘Sorceress’, OPETH returned to Rockfield Studios in Wales, where the Swedes had tracked ‘Pale Communion’ with Tom Dalgety. The experience was positive and historical - the countryside studio was also home to pivotal BUDGIE, QUEEN, RUSH, JUDAS PRIEST, and MIKE OLDFIELD recordings - there really was no other option for OPETH and crew. Limited edition 4 x 10” clear vinyl box set including Opeth’s Sorceress plus the bonus studio and live tracks included on the original release.